Celery root, also known as celeriac or celery knob, is just what its name would lead you to think it is: the root of the celery plant. This ugly brown hairball of a vegetable has a lovely mild, celery-like flavor with a starchy, potato-like texture. With "root" in its name, celery root is obviously a root vegetable. That means that it stores well, making it a real treat in fall and winter. Celery root is often available year-round, especially in temperate climates, but is at its best in the cooler months of fall, winter, and early spring. In cold climates, you'll find it during the summer and early fall. Freshly harvested celery root is sometimes sold with the stalks and leaves still attached, which are celery and should be used as such. Truly fresh celery root has a fabulously tender texture perfect in salads. Look for celery roots that feel heavy for their size. If any greenery or ​stalks are discernible on the top of the root, they should be fresh looking and neither dried out nor slimy nor wilted. Celery root is notoriously difficult to peel due to its many nooks and crannies, so look for specimens with as smooth of an exterior as possible. None are all that smooth, but the less deep the crannies, the easier the bulb will be to peel. 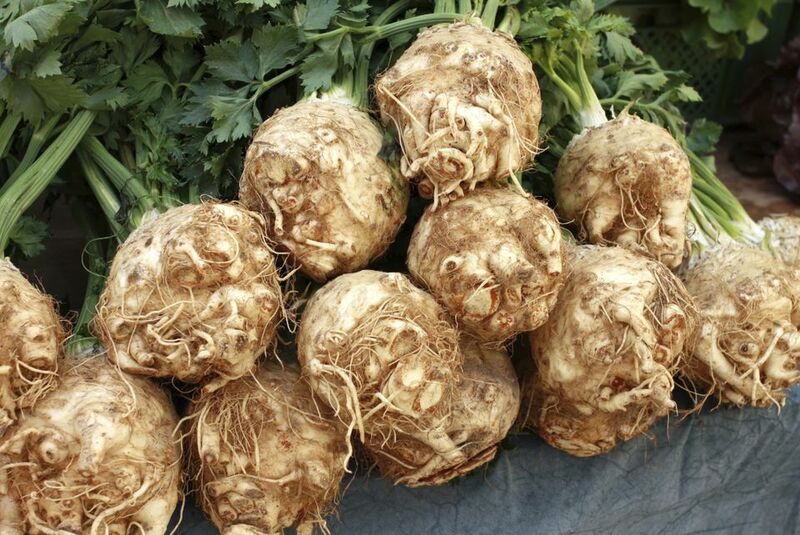 If you see celeriac at the market with long bright green stalks still attached, snap them up! Freshly harvested celery root tends to be more tender and easier to peel. Pretty as the stalks are, be sure to cut them off and store them separately when you get the celery root home—both the root and the celery will last longer that way. Since celery root is a root vegetable, it stores well and for a long time if it is kept cool. Having spent most of its life underground, it also enjoys the dark. Kept loosely wrapped in plastic in the fridge it will last up to several weeks—even longer if it was freshly harvested. Don't peel celery root to store it—the peeled vegetables will oxidize and turn brown. Don't wash it either. If it has dirt clinging to the peel (it often does) brush off what you can, then store the root loosely wrapped in plastic to keep the dirt contained. As with all root vegetables, bits of dirt clinging to it will actually help the celery root stay fresh longer. Celery root needs to be peeled, and be aggressive when you do it. Remove all of the slightly hairy brown exteriors to reveal the creamy, solid flesh inside. That fibrous peel is not fun to bite into. Celery root is most classically and commonly used shredded and cooked in a simple Celery Root Salad. It is also delicious added to soups (like Cream of Celery Root Soup) and stews. Add celery root to mashed potatoes for a great twist. Like all root vegetables, celery root is quite flexible, taking well to roasting, braising, or simmering.